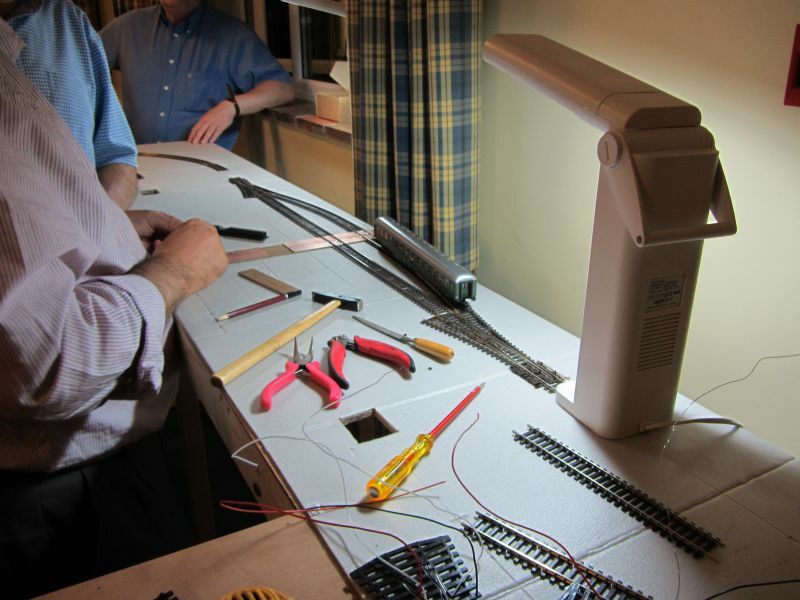 BUILDING A MODEL RAILWAY In the years 2010 to 2014 I ran 12 week long courses, as a member of the Liphook & District Model Railway Club (L&DMRC) and Liphook U3A, on building a model railway, aimed at those who wanted to build one for themselves or for a grandchild. Several club members assisted me. No actual practical work was involved, but the published notes of the weekly sessions, built up into a useful resource and several attendees went on to build their own layout and one joined the L&DMRC. The first course attracted 11 members, but subsequent attempts in following years attracted few attendees and in 2014 they were abandoned. In resurrecting the idea in 2017, I attempted a different format. The sessions were monthly of 2 hours duration. Those attending followed and if they wished to, assisted in the building of a small model railway, through from planning to construction. In between sessions I carried out the majority of the work and explained at each session what had happened and what has to happen next. It looks like I will manage to complete one OO scale diorama and most of an N scale tramway layout by the end of the first year(March 2018) It has been more of a working group, rather than a course. The drawbacks were- considerable pressure on me and problems with members attendance, such that on one occasion only one member turned up! Move to Redford Village Hall from our May 2018 meeting, due to introduction of extended hours at the nursery school using Milland Valley Memorial Hall (to meet government 30 hours a week edict.) which meant we could no longer keep our Wednesday slot. Building a model railway is often a solitary occupation and some like the hobby for that reason. However if you have taken up the hobby in retirement or after the death of a loved one, you would gain much by joining a club. You could get help on problems with building your layout; you could gain a pal or two in the process and best of all be part of a community that’s enjoying themselves- playing trains. One last point- if you’re a lady you can still take up model railways as a hobby. Although traditionally it has been seen as a male preserve, increasingly clubs accept, nay encourage, women to join. (No its not a cunning plan to get the teas made and the washing up done)- women, not unsurprisingly,make fine modellers and that’s what it’s all about! Please contact one, or more, of our local clubs- there are links to virtually all of them from this site- see RH side bar. Most encourage visitors to visit a regular meeting or two for free to check each other out. You will not regret it. Membership of the group is the cost of the hire of the venue used + cost of small consumables (not layout construction items) – divided by the annual membership. We currently receive 40% of our meeting hire cost as a subsidy from Liphook U3A. It looks like we shall have at least 6 members for the coming year. From February 2019 the annual subs have increase to £33 with the move to 3 hour sessions. We are still recruiting for additional members We have recently been added 2 new members from Petersfield and Milland which is promising. Our meeting location is in the centre of the small village of Redford, also in West Sussex and is a one roomed village hall with small kitchen, recently extensively refurbished, within 3 miles of of our original home in Milland. From Liphook About the same distance as to Milland, (3 miles) using a different route (use the road exiting Liphook in the direction of Hollycombe- go past that on the left , ignore the RH turning to Milland and the next turning on the left to Fernhurst and turn left at the War Memorial in the direction of Linch & Redford. The hall is on your left on higher ground approx 100 metres after village sign) From Petersfield you can go via Liphook or the A 272 in the direction of Midhurst turn left on the approach to Midhurst 30 mph limit, sign-posted Woolbeeding, Redford 3, Linch. This is a very narrow winding road, single track for over a mile, so not for the faint hearted. *Additional meetings- subject to demand we may have additional “workshops” in July, August,and December 2019 of 2 hours duration each, 3rd Wednesday (except July- 3rd Friday) and held in the Committee Room of the Milland Valley Memorial Hall. Iping Road, Milland GU30 7NA. There will be an additional charge of £2 per head towards the cost of these sessions, which will be subsidised by this website. The layout constructions being followed by the group in our first year were chosen from the following list. Click on the highlighted names for more detailed information including sizes. “East Hants Link” ** will cover up to 5 scenes along the line showing how light rail systems merge easily into residential and commercial areas. Although a scheme for light rail is not to proceed for Bordon/Whitehill, this layout will show how such a scheme might have looked. As most modern trams are of fairly similar designs throughout the world, I have chosen Japanese outline trams in N scale, as they are easily available at relatively low cost. The scale (1:150) is slightly different to the British N standard (1:148) but is closer than to the international standard of 1:160. As a trial I used Ikea type toy boxes as the baseboard for most scenes, but later abandoned it as it was difficult to model and lay track within the box and to align the boxes themselves. I resorted to using some spare conventional baseboards I had. Work is now well underway. This layout is partially completed with baseboard built, track layout completed and wiring well advanced. 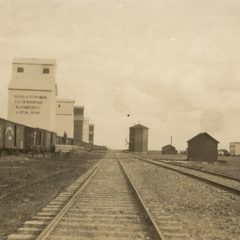 Some buildings have been completed. Idylton Vale ++ British outline 1:76 (OO) tram layout set in South west London- using Bachmann OO scale RTR Hong Kong trams, prototypes UK designed and built originally, so little work to Anglicise them. Street scene in area around New Malden/Kingston By Pass area immediate post war. Anywhere in liberated France. The locals are returning home from celebrating liberation & have stopped off to have a drink and a game with their pals. Usually an all men pursuit, especially in the era (late 1944) when this is set. A few British soldiers on and around a tank, are watching . Full details are on the group pages of the Liphook U3A website* www.liphooku3a.org.uk and of the Midhurst U3A website* https://u3asites.org.uk/midhurst/home . The local area Milland News , Liphook Community Magazine and Liphook Herald are kept regularly informed of our activities. Meeting dates are regularly provided to Vantage Point and Round & About free magazines distributed in our catchment area. Facebook local community boards for Fernhurst, Midhurst and Haslemere etc are being used to publicise the club, sometimes in conjunction with L&DMRC. Milland Valley Railway Modellers Open Afternoon “Model Trains in Redford”-Saturday 26th October Redford Village Hall GU29 0QF- – Family £1 (Full details available soon)Not an exhibition more a regular group meeting with the public invited. Plenty of opportunity to chat and ask questions about the model railway hobby. This will be the first public event we have organised and any proceeds in excess of the hire cost will be donated to the Railway Children charity. Liphook & District Model Railway Club 10th Annual Open Day- “Model Trains in the Valley” Sunday 27th October at MVMH Iping Road, Milland GU30 7NA 10.00 to 16.00 hrs- Entry Fee (Full details available soon) A well established local event with club and visiting layouts. We are also requesting donations (£1 per member per session) for unlimited tea/coffee & chocolate biscuits consumed at each session. The donations will be forwarded on a monthly basis to the Railway Children charity .